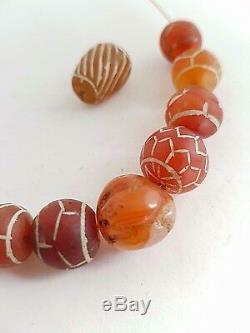 A beautiful strand of eleven, ancient, carnelian, beads all different, all with hand drilled holes and the patterns in 10 of them etched with soda, perhaps thousands of years ago. 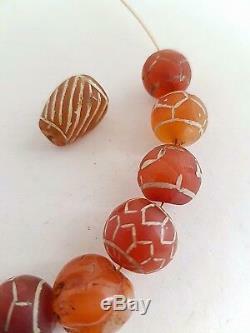 I don't know the exact origin or age of these beads, but similar were made in the Indus valley 3000 bc, and seriously prized for the skill in making and for religious purposes. 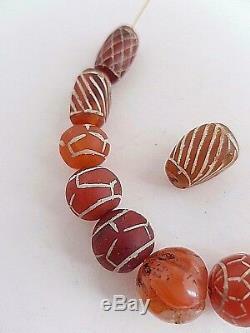 There's a carved carnelian pumpkin shape bead as well, not etched, but also really REALLY old. If you hold them up to the light, you'll see that the holes don't meet up easily in the middle, which shows they were hand drilled over a long slow process. The loose bead also has a hole through it, but it was too tricky to add it to my wire. I've threaded the rest on. One big has a big chip, see photos, but of course, being that old, it's a natural part of wear and tear. If everything was perfect, well, then, they wouldn't be ancient, would they! 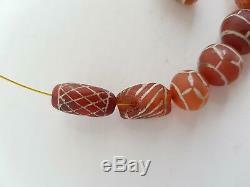 This is the last of these highly collectible beads. 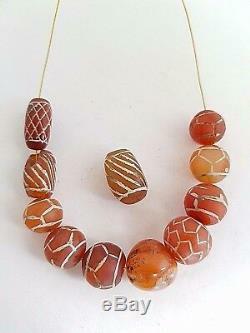 Fantastic for a jewellery project of your own. All my pieces have dings, dents, signs of wear and tear. If there's a serious flaw, I'll show you in the photos so examine them carefully. I don't polish them, I'll leave that to you, the new custodian! Enjoy your fabulous new pieceof history. 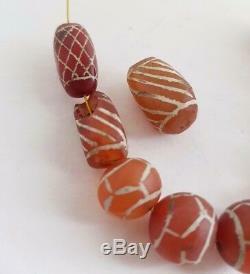 The item "Rare etched ancient carnelian beads Afghanistan (ELEVEN) BE/19/2" is in sale since Tuesday, January 15, 2019. 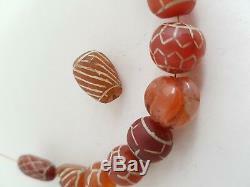 This item is in the category "Jewellery & Watches\Tribal, Ethnic Jewellery". 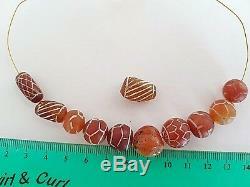 The seller is "savannacaravan2012" and is located in Robertson NSW. This item can be shipped worldwide.